RPS has just posted the 2015 SAT data. 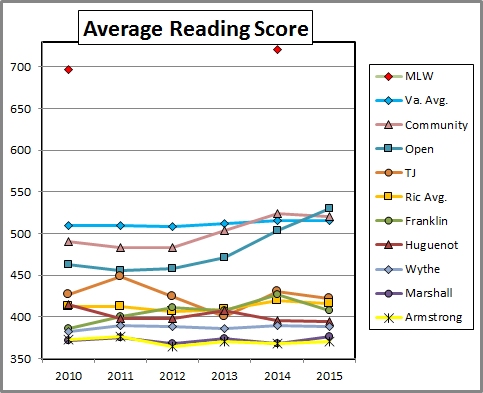 Here are the reading scores by school back to 2010, along with the division averages and the Virginia averages. 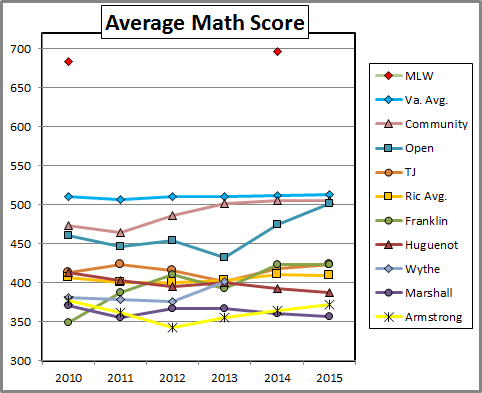 And here are the math scores. 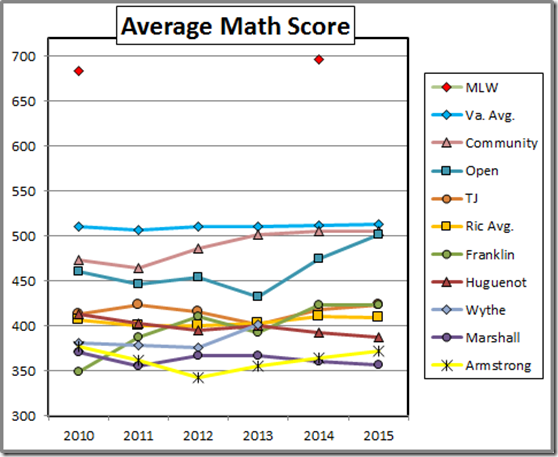 I’ve included the available data points for Maggie Walker (the 2010 data are from an RPS post; 2014, from Jeff McGee at MLW); of course, MLW is not a Richmond public school, albeit VDOE reports the SOL scores of MLW students at the high schools (that those students do not attend) in those students home districts. To provide some context, here are the 2014 (presumably; they were posted on 12/20/14) 25th and 75th percentile scores of the students admitted to Virginia public colleges, along with the 2014 Virginia and Richmond averages. Understanding these numbers is important when you plan how many colleges to apply to, and when you figure out which schools are a reach, a match, or a safety. 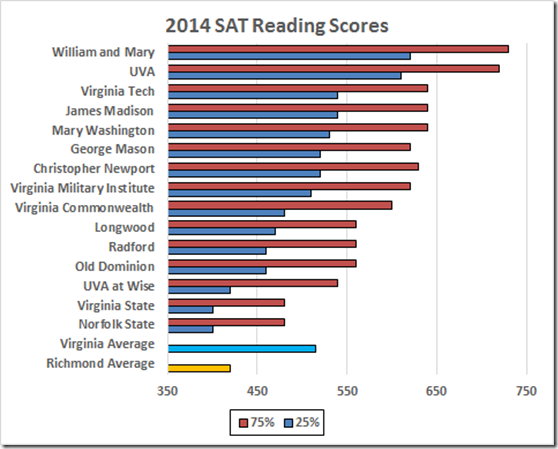 If your scores are below the 25th percentile numbers, you should consider the school a reach. Note that this does not mean you won’t get in — remember that 25% of students who enroll have a score that is at or below that lower number. 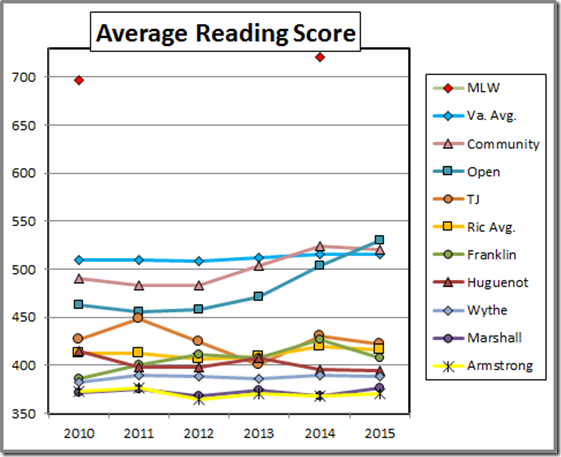 For sure, averages v. percentiles is an apples and pomegranates comparison. 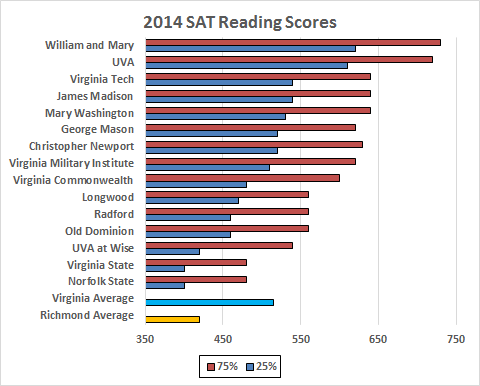 That said, the Virginia reading average is between to the 25th percentiles at VMI and Christopher Newport; Richmond is 95 points lower than that state average; for math, the Virginia average is between the 25th percentiles at VCU and VMI while Richmond is 102 points lower.